a brainchild of mine that was a concert/lecture series and alternative venue that I created in 1996. It’s been revived at various locations since many of the events took place in the various places I lived in Greencastle. Sometimes other music students requested I do an event in their dorm room and often events would be “site-specific”–taking place around Greencastle or on DePauw’s campus. Some of the presentations were more formal while others, like “The Packing Tree” (1997), was essentially a Flash Mob performance with audience participation. While I can’t claim to have done this several years before Bill Wassik’s first official flash mobs in Manhattan (and really, performance artists have been doing things like this for decades) it and some of the other impromptu performances I did or organized had a similar vibe. One of the reasons I created the Chello Shed was educational–as much for me as for anyone who attended the events. I’d started it not long after the internet was becoming available in educational institutions primarily because I’d spent so much time reading (in traditional print media) about all the experimental activity that had been happening since the beginning of the twentieth century. I was just as interested in performing all these works I had learned about (as well as composing my own) so the Chello Shed served that purpose. The first performance I did was actually in the woods behind Blackstock Stadium on October 5, 1996. The program included Raoul Hausmann‘s short phonetic poem “fmsbvtzu pgff kwie” (1919); La Monte Young‘s “X for Hentry Flint” (1960) which I performed on the frying pan; La Monte Young’s “Composition 1960 #5 (1960); Emmet Williams‘ “Voice Piece for La Monte Young” (1962); and two movements from Kurt Schwitter‘s epic 40 minute long phonetic poem, the “Ursonate” (1922-1932)–which was originally based on the Hausmann poem above. Here’s an excerpt from the first movement of the Ursonate (below) and here’s the score with streaming audio excerpts to all four movements. The second performance (October 26) after I attended a four day Symposium “Performance Art, Culture and Pedagogy” at Penn State (read a report about it by my late friend, Lisa Wolford, at the Theatre Topics Journal). By that point I would be performing my first experimental performance art pieces (“Something or Other” and “Five Aphorisms of an imagined wise man”) in the vein of the early Dada, Futurists, and later Fluxus artists. The third Chello Shed event was a reading of John Cage’s “Lecture on Nothing” followed by a discussion. I would eventually read several of Cage’s “Lectures” as well as perform several of his works at the Chello Shed. Occasionally I did delve into non-arts related presentations but for the most part during that one and a half year period from 1996-1997 the Chello Shed had presented well over a hundred performances, presentations, and discussions. 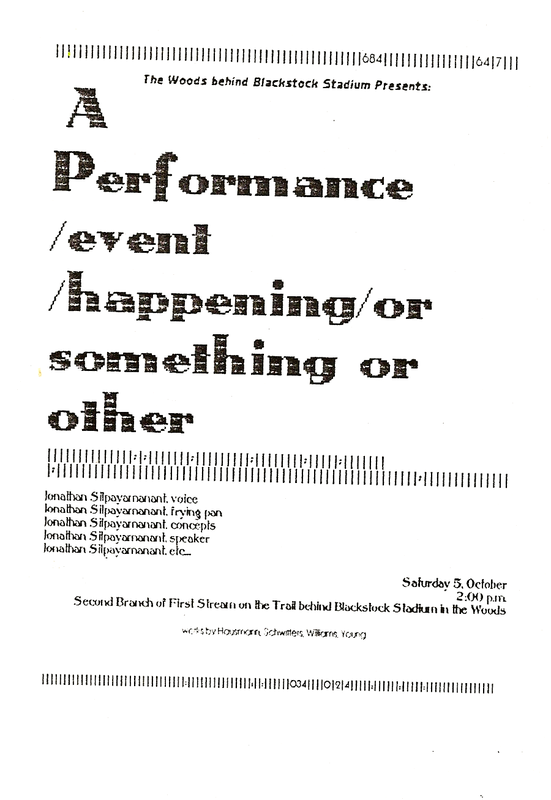 I had the opportunity to perform several dozens of my own and others’ experimental works which spanned genres like the Fluxus Event Scores, Phonetic Poetry, Text-Sound-Art, Performance Art, Experimental Theater, Electro-acoustic and acoustic compositions. I’m in the process if finding the old programs and flyers from those activities and have started listing them in a note at the Chello Shed facebook page here. As you can see, the NuMuLu thing is really just a continuation of something I’d been doing nearly 20 years ago (I still can’t believe it’s been that long) and now that I’ve settled back into the Kentuckiana region, I might as well do it here. In part II of this, I’ll talk about the Indianapolis activities and the INDYtron festival and resource website and how that is the intermediary link to NuMuLu.